Description: Rhizomatous perennial with slender rhizomes forming ovoid to ellipsoid tubers 5–10 mm diam., woody, with grey-brown fibrous coat persisting for two years. Culms trigonous above, terete for most of length, smooth, 30–100 cm high, to 3 mm diam. Leaves not septate-nodulose, rarely more than half as long as culm, 2–4 mm wide. Inflorescence usually simple, with 3–8 primary branches to 5 cm long, frequently drooping by the weight of the spikelets, often pseudolateral; spikes ovoid, to 4 cm long, to 3 cm diam. 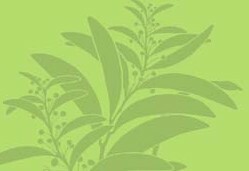 ; involucral bracts leaf-like, the lowest ± erect and much exceeding inflorescence. 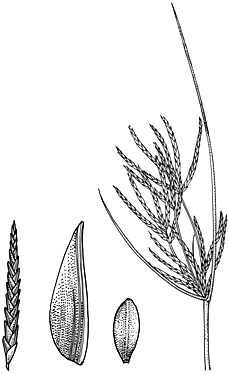 Spikelets flattened, 3–10(–15) per spike, to 40-flowered, to 40 mm long, 2–3 mm wide in side view; rachilla winged, persistent. Glumes with sides 1- or 2-nerved, 3.5–4 mm long, orange-brown to dark red-brown. Stamens 3. Style 3-fid. Nut trigonous, narrowly obovoid, nearly half as long as glume, 1.5–1.7 mm long, c. 0.7 mm diam., dark grey-brown to black. Distribution and occurrence: Grows on floodplains and stream banks inland, usually on clayey soils; widespread. Often much taller and less leafy than C. bifax and of much less value as a fodder plant, but it is useful in preventing erosion of stream banks. This has fewer and longer spikelets than in C. bifax, with mostly darker glumes and longer nuts. The inflorescence is usually pushed to one side by the erect lowest involucral bract. The culms are mostly longer and vary from trigonous near apex to terete below; they are generally softer than in C. bifax.